A 12-hole golf tournament is ideal for friends, family, corporate or charitable events. A 12-hole event is far more economical than an 18-hole tournament. As well, golfers can be off the course and ready for lunch, dinner or presentations in as little as three hours. 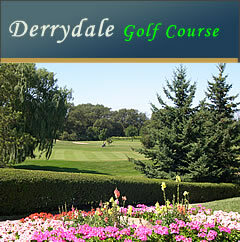 Derrydale can host your tournament Mondays to Saturdays with groups ranging from 12 to 60 golfers. and a scenic outdoor patio. tournament size and weather conditions. but no outside food or alcohol permitted. - All tournaments are a three or four-person Scramble format with ladies playing from the red tees and gentlemen playing from the white tees. For information on how a Scramble format works, contact the pro shop. - To make the event fun for golfers of all abilities, each group should have at least one experienced golfer. - Longest Drive, Closest-to-the-Pin and Putting contests can be a fun addition to your event. - Power carts are available (Optional). - Golf gloves and balls are available, as are rental clubs. 1. In accordance with Health and safety regulations, no outside food or beverages can be brought onto the golf course. 2. No shotgun format. All participants should be at the golf course 20 minutes prior to the first tee off. 3. $200 deposit is required at time of booking with full balance of greens fees due two weeks prior to tournament date. 4. 100% refund available if tournament is cancelled no later than 14 days in advance of tournament date. 5. Confirmation of number of golfers, as well as food and other requirements no later than two days ahead of event. For more information, contact Norm in the pro shop at 905-670-3030.